Halloween can be a fun holiday for craft projects with a good deal of language involved. Yes, fantasma (ghost)—I get to pick up some new language as well! A KAP spooky tree with ghosts added. 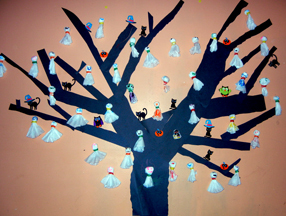 In KAP (Knowledge As Power) Family Literacy, we started our Halloween projects with a black construction paper tree put on the wall with a re-positionable glue stick. This glue stick turns any paper into a sticky note and is not supposed to harm the walls. We will test that at the end of the season. The children added stickers on the wall and tree. This week, we added ghosts. To make the ghosts we used coffee filters with one large cotton ball and a rubber band creating a head and flowing body. The face and extras were drawn on with markers. We again used the re-positionable glue stick to attach them to the wall. 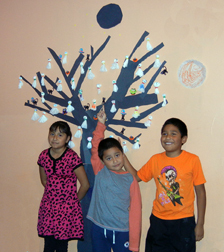 Three children in LV-A’s KAP family literacy program with their tree and decorations. It will be an adventure to see what goes on the tree next. Hop, jump, in and out of relationships wishing you will find your happiness. I watch you from the side as you hop, jump, in and out only to see you hurt yourself. Hop, jump. Today, you put on a smile and as you pretend that nothing is wrong, you’re only burning it deeper and deeper within yourself. Hop, jump, here comes another one to fill your void. May it not be a violent one, as you show no care for yourself, or for your body. Elizabeth Scott, although she loved school, was rarely able to attend due to an abusive home-life, then a host of moves to various foster homes. When life became more stable and she was finally in a place where she could go to school regularly, she was enrolled in the fifth grade. School was no longer a joy as she struggled with so many gaps in her education. She graduated from high school with minimal reading skills. Once she became a mom and her son entered the public school system, Elizabeth recognized that she needed to improve her reading skills in order to help her child succeed in school. She connected with a Literacy Volunteers tutor and has been working hard on her education ever since. Today, Elizabeth is able to help her son with his school work, and she has become a published poet. Stuck in the bottle nice and tight. Overly protective is a might. Over caring is not so bright. The day I was born, I was unwanted. I was born to two young people that had no heart to care for themselves or for the children they had. The best thing they loved was partying. They would create children and never want them. I was unwanted and I had to learn to be a parent to the other children that they created. I would feel bad for them because I knew they were also unwanted. We were made from two young people. I had to learn fast to be a parent, not just for myself but, for my siblings. We were often left alone and no adults were ever around. When they were around, we wished that they were not there. So much happened that DHS removed us from our parents. And still today, I feel unwanted. Publishing my work is a great feeling of pride. As a child, I was called so many things that tore me down. I was told from parents and classmates that I was a retard and that I was a nobody. I believed them as time went by. My life was rough. I would dream of writing to help not just myself but to help others. I do believe that we should help one another rather than tear each other apart. So, what does being published mean to me? It’s a great’s feeling to me!!! I am not stupid. I am not a retard. I am a person with feelings. Yes!!!! I have made it!!!! I am truly proud of myself for having the courage to write and follow my dreams of being a somebody. 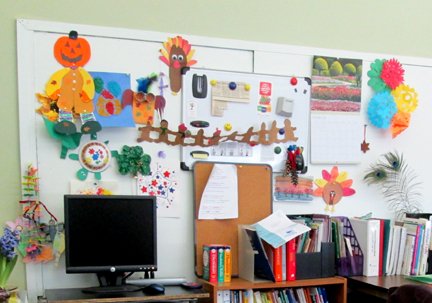 Welcome to the Child Educator area of our office space! 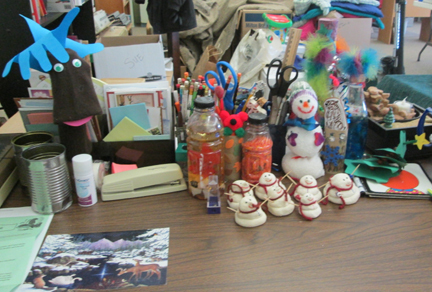 This is my desk, which is surrounded by projects done this year. The family has several school age children and both they and their mother enjoy the craft projects. The projects are often seasonal and offer much opportunity for the use of language concepts andpracticing English. The scarecrow, turkey, and owl were done in the fall. The turtle was late summer. The gingerbread kid garland and snowmen were from the winter. We ended the winter crafts with the colorful snowflakes that were inspired by one of the books we read. 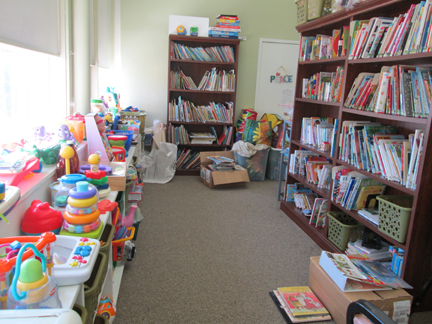 Our family literacy area is colorful and includes toys, games and books for a variety of ages. Items range from rattles to noisy toys that are appropriate for learning the connection between doing something and getting a response, to puzzles and games. The challenge is to bring age and developmentally appropriate toys and activities that can be used around smaller children. Most little ones go through the “world according to the mouth” stage where there is much oral exploration. Safety is a constant factor. toys. We have foam blocks that mimic wooden ones but are much easier to carry, Megablocks and Duplos. There are single piece wooden puzzles and more complex jigsaw floor puzzles as well as smaller, simpler jigsaw puzzles. Drawing paper and crayons, markers, scissors and glue sticks are a basic as are white boards and dry erase markers. Little cars are a staple for some children along with toy animals, puppets and doll house items. There are many pre-reading skills that need to be practiced to help children be ready for school. Reading with a young child is an exciting experience. The first thing to do is let go of the idea that a child will sit, listen, and look at the pictures and words. A very young child can take devouring a book quite literally. Haven’t we all seen well-chewed edges on board books? This is normal pre-reading behavior in “the world according to the mouth” stage — around six to nine months of age. As a child grows a little older, it is often the pictures that are of interest. Look at the pictures with the child; point out details according to the youngster’s interests. Don’t stop reading—even if the child wanders off to play. A toddler can still be listening and may wander back. If you sense that your audience has lost interest, put the book aside for a while, but leave it where it can be found. Have books handy for quite times in every room in the house. Letting a child know that you value reading is important. Let your child see you reading. It can be a book, a magazine, the newspaper or a cookbook. It is never too early to let a child know that reading is for pleasure as well as for information. Scrabble Fest will be held Sunday, May 18, 2014, at the Hilton Garden Inn Riverwatch Ballroom from 12:30 to 4:00 PM. 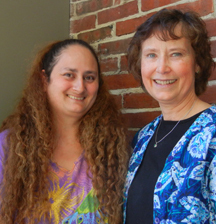 Literacy Volunteers-Androscoggin thanks donors who provide the wonderful prizes for LV-A’s top fundraisers. Our most recently donated prize is a signed, framed, limited edition print of local artist Ron Bosse’s award-winning watercolor, “Rue Petit Champlain, Quebec.” Some of the other prizes are listed on our website, http://www.literacyvolunteersandro.org/Scrabble-fest2014.html Prizes and their photographs will be posted as they come in. LV-A Board Chair Jim Handy serves as Timekeeper at a table with the Tiletastics’ team members Ben Redmind, Diane Greene, and Lisa Galarneau. a bit different than the game played at home. For instance, four team members play off of one rack of letters! The tournament rules and basic game play rules are also available on our site. Look for Players’ Information on the Scrabble pull-down menu. 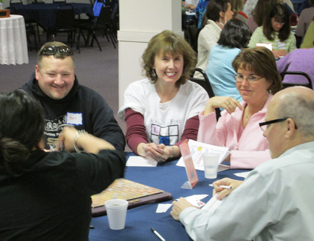 Scrabble Fest is a fun afternoon of game play and friendly — or intense, in the Pro division! — Scrabble competition. It is also a chance to help others in your community. All proceeds are used to provide for local literacy tutoring, LV-A’s Knowledge is Power (KAP) family literacy program, and English language classes in partnership with Auburn Adult Ed. Each day I allow a few minutes for my students to talk about current events – a holiday or something in their lives that is important. One day, a student asked me, “How do I lose weight?” As a result of this discussion, I did a lesson on the topic. 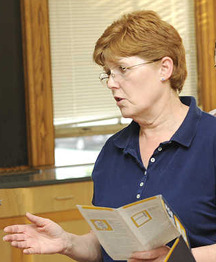 I then decided to call UM Cooperative Extension’s nutrition associate, Ruth Cyr for some additional input. Ruth Cyr and I organized a curriculum that would meet goals of increasing students’ reading, writing, math, and language skill as well as include the topics of health, food safety, nutrition, fire safety and physical exercise proficiency. I also wanted this hands-on experience to help students in other areas of their lives such as cooperation, self-esteem, and developing friendships. A tall order but one we successfully met. Students taking part in the Healthy Eating Program have learned cooking skills, healthy meal and snack planning, kitchen safety, and ways to get more exercise. This Program uses protein sources of beans, eggs, cheese, peanut butter and chicken. Dishes prepared use grains, vegetables, fruits, and dairy along with the proteins. These meals are low cost, healthy, reduced sodium and lower sugar and are easy to prepare. The students were excited at the start of each class. Every student participated in preparing the meal and in the clean up. To make this event more special, I brought in a cloth tablecloth, which the ladies loved. In each following lesson, the class discussed what had previously been learned. Each session students were able to take home samples for their families to try. The series of classes ended with a breakfast of cheese, vegetable omelets, pumpkin chocolate chip pancakes and a variety of fruits. As part of our literacy program the students wrote thank-you notes to Ruth. I put a sample thank-you note on the white board. I then went to each student and asked them to dictate a letter to me of what they wanted to say to Ruth. I then wrote down their words and had each student copy their personal thank you note. One person couldn’t tell me this in English, but I had her tell this to another student and that student told me in English. I then wrote down her words and she was able to copy them. This teacher loved the pizza with carrots, also the Thai dish and making bread in a Ziploc bag. All goals were met and exceeded my expectations. The students loved the hands-on cooking experience and became better readers and writers. Their language became more fluent, they were more cooperative with each other, and new friendships developed. 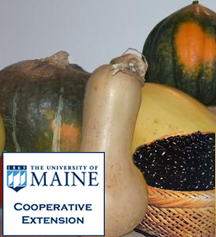 Our thanks go out to the University of Maine Cooperative Extension and Ruth Cyr for helping our families by providing a cooking program that developed skills in literacy and life. Below is the recipe from the UM Cooperative Extension for Bean and Squash Chili, which was a definite hit! Recipes for an omelets and bread in a bag will be posted later. The Extension offers many great recipes on their website. They also offer lots of gardening, health, and nutrition information. Their booklet on reducing salt in the diet is an good example. Combine all ingredients in large pot; cover and bring to a boil. Reduce heat to low, cover, and simmer for 20 to 25 minutes, stirring occasionally. A half-pound of cooked ground beef, turkey, or chicken may be added. Add hot sauce as well if you like more spice!